SPEAKING OF DENTIST, I think I kept a pretty good record of M’s primary teeth when they fell off. And being sentimental me (or mad, one might say), I even kept them – all 20 of them!!! At a glance, this looks like custom-confiscated items of the white stuff! 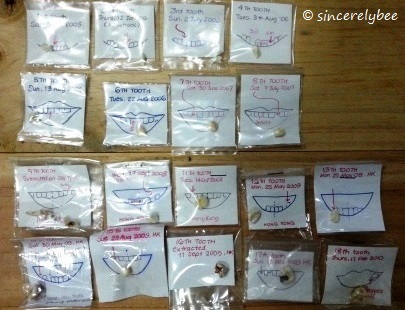 In reality, each of these packets contains M’s baby teeth (18 of the total 20) that fell off / were extracted, between 2005-2010. The first tooth to fall off was the central incisors on 5 Dec 2005; which grew back by the time her third tooth fell off on 2 July 2006; she’s seen here smiling in a photo taken on 7 July 2006. A bloodied sight, yet M wasn’t the slightest afraid at all, in fact she pulled out the wobbly tooth herself – the 5th – on 13 Aug 2006; followed by the 6th tooth a week later on 22 Aug 2006. (In fact, she also pulled out herself the 14th tooth on 30 May 2009). The “souvenir” tooth #5 and tooth #6! 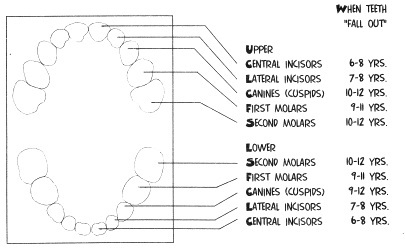 The teeth chart will be useful soon when Little Em’s teeth start falling off! She’s already anxious to meet the Tooth Fairy! This entry was posted in Happy at Home, Little Miss America and tagged Home, Kids. Bookmark the permalink.